My good friend Barry Reiter, who is an “elder” in our woodworkers guild (CFWG.ORG), and a retired chemical engineer put on a presentation last week on spraying lacquer. His depth of knowledge and experience made the presentation very enjoyable and I learned a lot. I hope there is a part 2 and maybe 3, because the hour allotted just wasn’t long enough. Anyway, I got the bug for trying out what I learned, and the next day in the shop I took out my little detail HVLP 4oz spray gun. I mixed 2 parts of lacquer to 1 part of lacquer thinner, and stirred it up real good. Then I set my gun at 20 to 22 lbs pressure, and I set my spray pattern just the way I like, and I went at it. 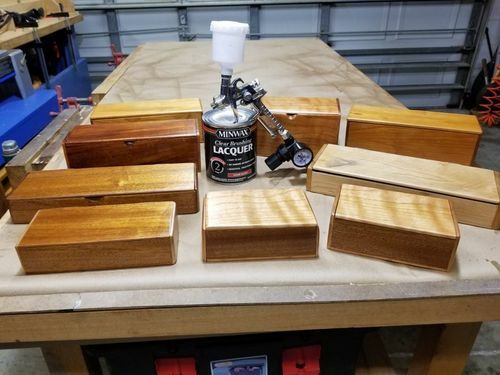 The boxes in the picture are just made from some nice scrap from my off-cut barrel, and after 2 coats of spraying, they looked and felt beautiful. 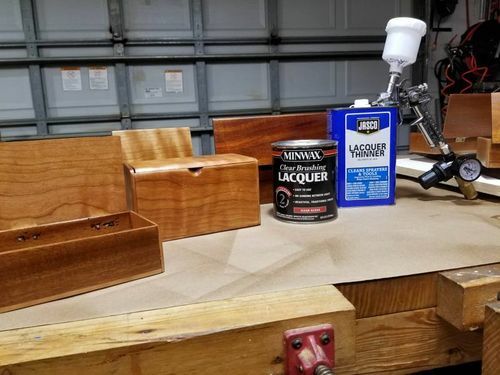 It’s very nice that you don’t have to sand between coats of lacquer, and with the drying time only about 20 to 30 minutes, you can put on 3 coats in about an hour. I will be a sprayer from now on, and thank you very much Barry. Woodwrecker, thanks for posting this. I will have to give it a try. I may have to give that stuff another try. Looks very good. I am spray all the way. My only regret was not doing it sooner. Gonna have to give it a shot. I have given thought to spraying, it’s no doubt much quicker and easier than hand or brush applications, but haven’t attempted it because of what I thought would be the necessary precautions – dedicated spray area or booth to contain over spray, with proper air circulation, and safety gear such as a mask, etc. Did you find this to be true?, or did you simply spray in your normal work area as if using spray cans? I’ve always wanted to be able to spray but my shop is really too small and not ventilated well enough. Congrats on the new skill!! Spraying is the way to go. If you only spray small objects like Woodwrecker’s boxes, you really need no more than a workbench surface (covered with cardboard or that infernal package paper Amazon so loves). Surround the table on three sides with painters plastic. The 6-mil is great if you attach it to your ceiling and have a way to roll it up out of the way when no in use. Make a turntable or two so you can spray all sides from one standing location. Lacquer fumes are not too bad (but are a bit stinky). Either leave the shop for a while after spraying or put a fan in the window to air it out. Lacquer dries so quickly that problems with overspray are minimal. Of course everyones setup needs to be different depending on their requirements. Yep, give all your brushes away. You’ll never use them again. I like to spray lacquer too, especially the “non-yellowing” variety sold these days. I always sand between coats though, so I wouldn’t skip that step. I used to be a lacquer guy, but now I’m a precat lacquer guy. I used to be a lacquer guy, but now I m a precat lacquer guy. It’s right next to a can of lacquer thinner, so he’s doing it right. I started out using Deft and still have some pieces I put it on that look great. I’ve kind of gone full circle on lacquer. Starting with the big box brand, moving on to Sher-Wood pre-cat and now I’m really enjoying Sher-Wood CAB. It’s a bit friendlier when touch-up is needed and levels beautifully. I’ll definitely stick with catalyzed for things that need durability though.